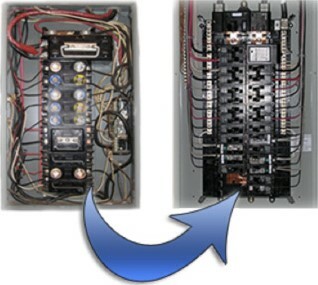 Old main panels have limitations on available space to add circuits or they have fuses (some insurance carriers will not insure a property that has fuses). An electric service upgrade is often recommended or required to increase the capacity of the existing electrical service. With all the new appliances and technical devices, we now have in our homes, we find that older homes just don’t have sufficient power available to handle the increased demand. A panel upgrade or replacement is usually required to alleviate a problem. By using a larger fuse, you may stop the problem of the fuse blowing but the wire is rated to carry only 15 amps. Now that you’ve used a larger fuse the wire may becomes overheated; these wires are running through wood studs in the walls giving a potential for fire. This is why insurance companies usually get uptight when they find out the home has a fuse panel and recommend that the panel be changed to a breaker panel system. One of the most important purchases you have or will make in your lifetime is the purchase of a home. If this is an older home it’s a good idea to have an inspection of the wiring done. An electrical inspection will include the inspection of the electrical system in your home, from the wiring outside to wiring of outlets inside including the panel. Whether you are buying a home or already own it, a regular inspection of your electrical systems should be done. If you are doing Home Renovation or Addition, finishing a basement, you may want to to add lights to a patio or install lights in your backyard, we can do it for you. We'll set up a time to come out and have a look at what needs to be done and provide you with an estimate. For new construction, bring or e-mail your blueprints to our office for an estimate. A ground fault circuit interrupter is a device that shuts off an electric power circuit when it detects that current is flowing along an unintended path, such as through water or a person. It is used to reduce the risk of electric shock, which can cause the heart to stop or cause burns. They can also prevent some fires, like when a live wire touches a metal conduit. If a GFCI device trips and after the problem is fixed, the GFCI device must be reset manually by pushing the reset button (the red button in the image shown at right). An older home may not have grounded outlets, to check, plug a circuit tester into each outlet and look at the indicator lights. If the lights indicate the outlet is not grounded properly. While it is not usually required to upgrade your home, it is still a good idea to do so and bring your home to code. 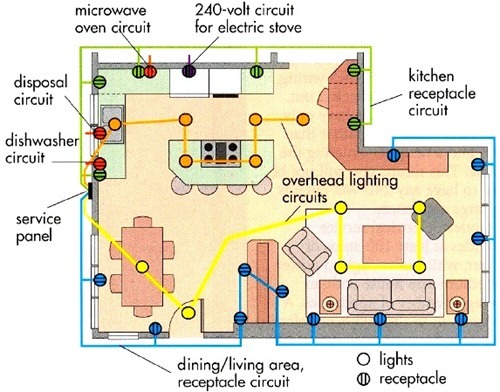 The ground provides an alternate path for electricity that may stray from an appliance or product. 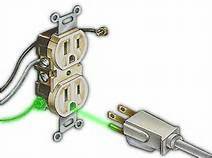 This is an important safety feature that has been required since 1962, which minimizes the risk of electric shock, and allows surge protectors to protect your electrical equipment. A surge protector plugged into an ungrounded outlet will do nothing, and you could fry your new plasma television, computers, stereos, and other devices. 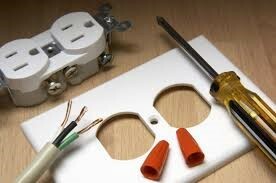 The heart of a home's electrical system is the breaker box, formally known as the main service panel. This is where the utility power comes in from the meter and where all the power is distributed to the various branch circuits of the house. All homes have a main service panel. A sub-panel is a smaller service panel that distributes power to a specific area of the home or other building on the property. Sub-panels are added to a system for three main reasons: space, convenience, and efficiency. Service panels have only so many slots for installing breakers (and thus circuits); when the slots in a main panel are all filled, a sub-panel can be added to provide more space for circuits. Sub-panels are used to extend a feed for multiple branch circuits to a specific area of a home or building at some distance away from the main panel. A garage, outbuilding or room addition might be a place to put a sub-panel.